One of the things I liked about Word Bandit from Drumond Park is that it is actually four games in one. It’s a game for those aged 8 and over and you play in two teams. The teams can have any number so it’s pretty flexible and you can even up the teams in terms of age and ability to make things more exciting. Basically Word Bandit is a word-spotting board game that comes with an exciting wheel-spinning letter machine. Inside the box you’ll find a Word Bandit machine, playing board, two playing pieces, sand timer, sticker sheet and instructions. There’s minimal set up to do – just put a single sticker on your Word Bandit machine. The rules are easy, so you could be up and playing within about 5 minutes. Each team picks a playing piece (red or blue) and puts it on the red starting space. As you move around the board, the space you land on dictates which of the four games your team will play. One of the team pulls the bandit’s handle to spin the wheels each turn, and the opposition counts the score. Red spaces use just one row of letters. You have to shout out as many words as you can that contain any two of the letters you have spun. Yellow means you play with two rows of letters. 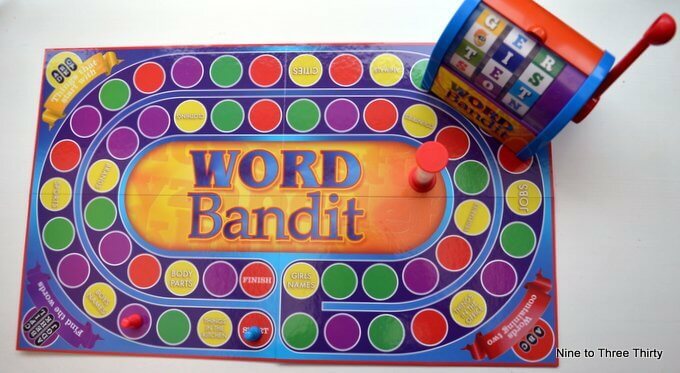 You must come up with as many words as possible in that category (each yellow circle on the board has a category printed on it) beginning with one of the letters on display on the bandit. You can use any letter as many times as you like, as long as the words are different. A green space means Famous People. The aim here is to find the initials of as many famous people as possible while the sand runs through the timer and the letters do not need to be touching in the grid. If you land on a purple space, you play Winding Words. Open the sliding cover on the machine to reveal four rows of letters, then pull the handle to spin the word wheels, which come up with a set of random letters. You race the timer to find as many words as possible that wind around the grid of letters. The letters of these words must follow on from each other, but can be in any direction. It’s a fun game that should help with vocabulary building and general knowledge, but it’s a great one to play with a group of family or friends. I have a copy of the game to give away to readers, so enter via the Gleam widget below. 5. Competition closes on 31st October 2018. Thanks! This game sounds fun! This looks really good, educational too! Nice prize. Would be Wonderful for our group, as we have a Common Room (Brand New). Aim being to reduce Social Isolation of tenants and residents. This looks like a fun game to play as a family. This looks like a great game! wow, great pressie for kids this christmas!! This looks like a fun family game. Looks like great fun for all the family! Looks great fun for Christmas. We’d love this. My son loves spelling! Looks like an absorbing game – fingers crossed!